As an on-the-go country, most of us grab the first thing that’s in our pantries for a snack no matter how unhealthy it may be. We stop at gas stations and load up on chips and candy because we forgot to pack snacks, and we go through drive-thru fast food restaurants because it’s easy and convenient. Eating healthy can take time, prepping, and going the extra mile to make sure what you’re putting into your body is actually worth consuming. However, eating healthy doesn’t have to be the difficult process that you may think it is. For example, if you take the time to shop at the grocery store for snacks that are easy and healthy to put together, then you’ll find that eating healthy is actually a lot more simple and inexpensive than you think. From our fitness center to you, we want to make sure that you enjoy snacks that are healthy and easy to make. Many people think that eating healthy is expensive and it can be if you go to the wrong stores. If you notice in your local grocery store the healthy food isn’t as expensive as you think. If you begin to concentrate on the outside of the store and don’t purchase junk food, you’ll find buying fruits, vegetables, and other snacks aren’t as costly and are even easy to put together. When it comes to snacks, you only need that item instead of putting a large meal together. If you’re an on-the-go person who wants to start eating healthy, then these five snacks are a great place to start. You can find this on the outskirts of the grocery store. Cottage cheese comes in single servings and is high in protein. Greek yogurt is a great alternative if you don’t like the chunky texture of cottage cheese. Greek yogurt doesn’t have as much protein, but when you purchase the zero percent or two percent single servings, you’ll get some serious fiber. With both of these, all you have to do is grab it out of your fridge since it’s already packaged. 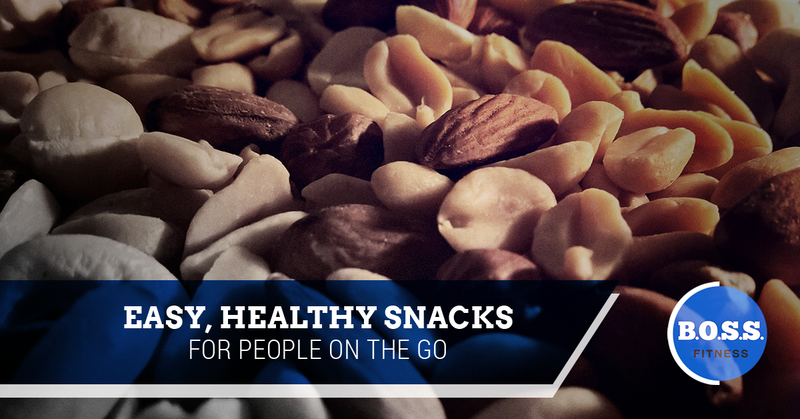 A little serving bag of nuts will take you about two seconds to put together. Just measure out a serving and place it in a bag so it’s ready to go. For peanut butter, you can buy little packs to take with you to work. Cut up a few vegetables or make ants on a log with raisins and celery. Filled with protein and other vitamins, you’ll be surprised at how full you feel. Take some time at night or on a Sunday and boil a week’s worth of eggs. You can eat them for breakfast or as a snack for the middle of the day. Hardboiled eggs are a great snack because you just place it in a bag or a plastic container, add some seasoning, and then take it with you. Filled with protein, this snack also lowers cardiovascular disease and a risk for breast cancer. Make your own or purchase a little snack bag of trail mix at the store or even the gas station. If you find that you forgot to pack a snack, trail mix is a great alternative when you go to the gas station and want to load up on snacks. Trail mix is very versatile because you can decide what to put in it. Dried fruit, nuts, M&M’s, and anything else you want to throw together in a bag is a delicious way to get some protein. The portable cheese platter includes throwing together some pieces of cheese, nuts, and crackers. Pack a string cheese, some healthy crackers, and almonds in a Tupperware to bring to work for some healthy fiber and protein action. Stay tuned for more of our blogs from a fitness center to stay in shape.